Authentic boys & girls turnover top knee length socks in larger size. 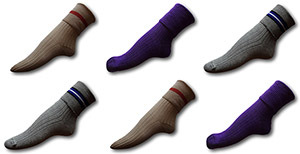 A range of exclusive turnover top socks that are available only at 'Albert Prendergast'. You simply will not find these socks anywhere else. Traditional 4 ply thickness and made from 80% wool and 20% nylon. This makes them suitable for machine washing. The most traditional school socks you are ever likely to find. Extremely thick and suitable for day wear during the winter months. A selection of traditional knee length school socks by Scott Nichol. These are no longer available from any other location apart from Adult Size School Uniform.. All of these have trim bands or contrasting turnover tops. A selection of vintage school socks by the Scottish manufacturer known as 'Jayfors'. These socks were also made under the brand name of 'John Ford'. 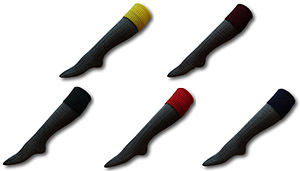 Each pair is made from 80% wool and 20% nylon. In some cases these socks are more than 20 years old but are still in brand new and unworn condition. 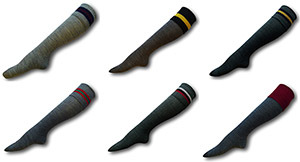 A selection of knee length school socks from various manufactures. In various shades of grey with an assortment of trim. 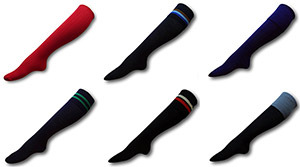 A selection of 2 ply and 4 ply knee length woollen school socks. Some are solid in colour and others have trim bands or a contrasting turnover top. 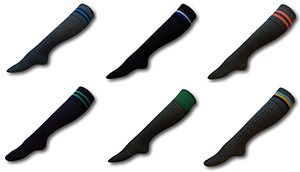 A small selection of ankle length school socks with trim bands.